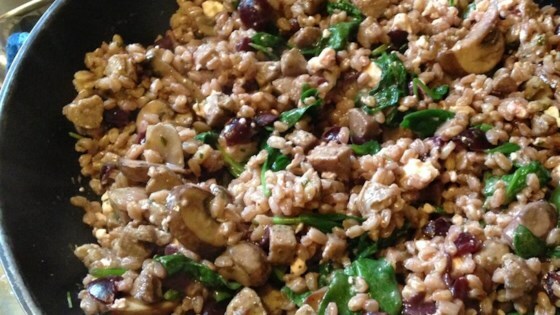 "Farro, a cleaner nuttier taste from barley, pairs so well with jalapeno chicken sausage, black cherries, mushrooms, spinach, and goat cheese. Serve with toasted baguette. Wow! Who would have thunk it?" Bring a large pot of lightly salted water to a boil. Cook farro in the boiling water until tender, 20 to 30 minutes. Drain. Cook and stir cherries in a small saucepan over medium-low heat until liquid is released, 5 to 7 minutes. Add red wine and 1 pinch salt; simmer until cherries soften and sauce is slightly reduced, 15 to 20 minutes. Remove from heat. Heat olive oil in a frying pan; cook and stir sausage until browned, 5 to 10 minutes. Add mushrooms and a pinch salt. Cook and stir until liquid is released from mushrooms, about 5 minutes. Stir farro and white wine into mushroom mixture; cook until wine has evaporated, about 5 minutes. Remove pan from heat. Add spinach, parsley, and cherry sauce; stir until spinach is slightly wilted. Stir in goat cheese until melted; toss well. Delicious dish with farro, wild mushrooms and cheese. Farro needs to be cooked for much longer, it wasn't tender at all. Other than that an OK recipe. This was amazing! It was even better the next day. I didn't see the added value in the wine so I am going to be using veggie broth next time to save on calories. I tried it just as it's written and it was delicious. I was looking for a recipe for Farro and this fit the bill. We enjoyed this recipe, but I was nervous how all of these flavors would go together. My dinner guests and I all agreed that getting tart and flavorful cherries is important for this recipe. We followed the recipe as written, and found it delicious. We will definitely be making this again.